We have looked quite a bit at continuous functions so far, and now we will put out attention on functions that are continuous on compact sets $X$. The following Theorem tells us that if $(S, d_S)$ and $(T, d_T)$ are metric spaces and $f : S \to T$ is a continuous function then for every subset $X$ which is compact in $S$ we will have that $f(X)$ is compact in $T$, that is, compact sets are mapped to compact sets under continuous $f$. Theorem 1: Let $(S, d_S)$ and $(T, d_T)$ be metric spaces and let $f : S \to T$ be continuous. 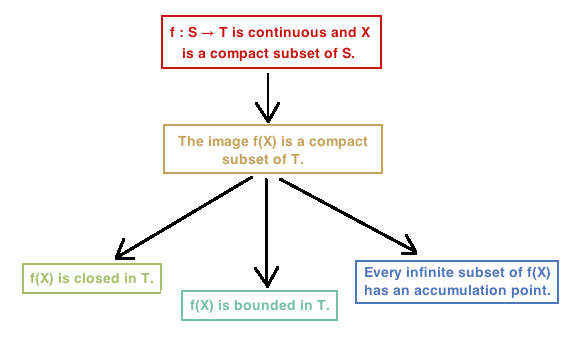 If $X$ is a compact subset of $S$ then the image $f(X)$ is a compact subset of $T$. Proof: Let $X \subseteq S$ be a compact subset of $S$ and let $f : S \to T$ be continuous. Corollary 1: Let $(S, d_S)$ and $(T, d_T)$ be metric spaces and let $f : S \to T$ be continuous. If $X$ is a compact subset of $S$ then the image $f(X)$ is: closed, bounded, and every infinite subset of $f(X)$ has an accumulation point. The following diagram illustrates the results of Theorem 1 and Corollary 1.